Nanshiungosaurus bohlini is the bigger species of the two known nanshiungosaurus species. It was 7 metres long with a weight of 1-1,5 tons. It was a therizinosaur with huge claws a long neck and short tail. Although some suggest that therizinosaurs were feathered, theres only one from which we know that he had feathers : Beipiaosaurus. so I drew him with scales. there arent any clues that it had them. I simply wanted to do sth else than most artists do. And as thre arent any clues for feathers in nanshiungosaurus, i simply made it without them. As far as I know the only therizinosaur where we have definite clues for feathers is beipiaosaurus, and he was rather small. It's called phylogenetics. If a member of the same family or a relative earlier than you has something, and a relative after you does to, chances are you also have it, unless evidence says otherwise. 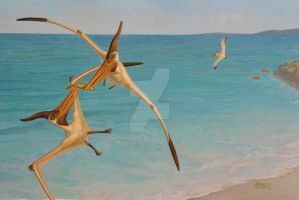 So Closest relative with feathers to Nanshiungosaurus is Beipiaosaurus, and the closest living relative after is birds. Chances are it had feathers. So far it is safe to assume all maniraptorans have feathers, and drawing otherwise is inaccurate. And even if it didn't have feathers, it wouldn't have scales, since feathers replaced scales, and all that would remain would be skin (In about 90% of it's body), like in featherless birds.